Raga is the liking accompanying pleasure. Raga means attachment, to connect. One attaches to the feeling and perception that a given association, attachment or connection will make you happier. Today – observe when we are attached through raga and the outcome it has on the physical actions performed, mind and emotions. Self-awareness, self-analysis and self-study. Sw. Satyananda always said “experiences in this life you are the laboratory and you are also the scientist”. Ultimately you have to make your own body & mind, your own life the experiment ground, the experiment lab in which you can discover a new form of life. Observe all the diversity of events with balance of mind. Dwesha is the repulsion accompanying pain. When you do not receive pleasure from the object of attachment, you lose your balance of mind and experience suffering and dissatisfaction. This is the state that Patanjali described as dukkha anushayi dwesha. Today – observe when we are dissatisfied through dwesha and the outcome it has on the physical actions performed, mind and emotions. Cultivating virtues while living the material life is the sadhana of human life. If you can cultivate the right virtues, you can improve the garden of your life. Virtues are not intellectual concepts: they represent behaviours of the mind. Include the awareness of equanimity as a virtue to practice in watching responses and reactions to mental, physical and emotional events during the day in relation to Raga – attraction & Dwesha - aversion. It is possible to overcome the afflictions of the mind through practice and through non-attachment. As long as the mind pursues the senses and sense objects, it is distracted, dissipated and volatile. When the attractions for sense objects and sensory fulfilment reduce, the mind becomes peaceful and quiet. Today – observe which of the senses is most dominant and how much it distracts and dissipates one from being in the present here and now. Cultivate the quality of non-obsessiveness to reduce the pull of the senses. Santosha. Cultivate contentment in life. Whenever you come across any discontentment or discord, always think the opposite. That is called pratipaksha bhavana. In reactive behaviour discontentment sets in and in positive behaviour contentment sets in. Practise connecting with your inherent positive nature. Feel gratitude and consider where you have chosen to be and what you have chosen to do. In yoga, the two words viveka, discrimination and vairagya non-attachment, are often used. The word raga means attraction and dwesha means repulsion. Patanjali’s Yoga Sutras state that raga is seeking pleasure and happiness and gravitating towards objects that will provide that satisfaction. We are attracted to whatever gives us pleasure and we reject whatever gives us pain and suffering. It is a normal human trait to avoid anything that gives us pain and try to obtain something that gives us pleasure. Our life moves between pleasure and pain, attainment and loss. Raga and dwesha are the two shores of the river of life. When we think about viveka, discrimination, we can begin to understand how we function. Discrimination involves knowing, awareness. Without awareness, discrimination does not exist. Awareness means having the ability to differentiate between what is appropriate and inappropriate. Viveka & Vairagya are attainable through the yamas, niyamas and meditation. Yoga begins with the yamas and niyamas for this purpose only, so that we begin to prepare our mental ground. Today – watch the mind following the senses without discrimination and how the mood of the mind changes to dissatisfaction and just as the tortoise withdraws its limbs – likened to the senses, withdraw the mind with the power of viveka - discrimination and wisdom. Cultivate the quality of vivek – discrimination with Abhyasa to reduce the pull of the senses. Source of the Mind – in order to know the mind know its source. Four functions of Mahat – means the great mind or the higher mind. It is also call antahkarana, which literally means inner or subtle instrument. Today – take any aspects of the mind and observe habitual patterns of body, mind and speech. Ahamkara: is the realization that I exist. Chitta: the second function of Mahat is chitta, the dimension where karmas and samskaras are stored in the deep unconscious. Buddhi: the third function of Mahat is buddhi, rationality and logic. Due to the connection of the mind with the world of sense objects through the sensory media, it is in buddhi that vasana, desire, are born. 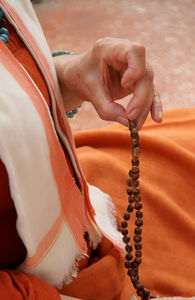 Manas: the fourth function of Mahat is manas. It is also translated as mind due to which there is often confusion about which mind one is talking about, the lower mind or the higher mind? Manas is not mind, its function is sankalpa and vikalpa will and doubt.